Do you REALLY Need Beginner Lessons? Why waste your time and money doing something you have already learned? With our special part trained lessons you will be ready for your driving test sooner rather than later. Do not be surprised if we book your driving test straight away. Assuming you have passed your theory test, we can book in you test and the lessons needed, so within a few weeks you will have a full driving licence. The thing is you can already drive can't you? You have already taken lessons with another driving school or perhaps been driving with friends and family so what you need right now is a little direction and support to get you to test standard. Your journey to passing your driving test is really simple. In actual fact what we will do is build a lesson plan, highlighting what you are good at, what you need to improve on and what you need to learn. This is going to cut out going over what you can do and concentrate on where you need to advance your skills. As you can see our system is going to save you time and money and that is important for everyone but we are also going to make you into a confident driver, to a point where you know you have the skills to pass your driving test in Oxford. 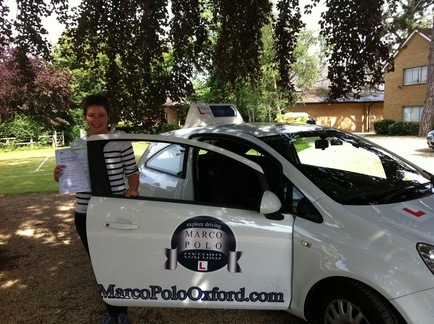 When you meet your driving examiner you want to know exactly what he or she is expecting of you and this is where you will excel with Marco Polo Oxford Driving School. The examiner wants to see you are safe on the road, that you are aware of your surroundings and in control of the car at all times. The ability to show that through your test is going to give you a full driving licence. So before you go into your driving test in Oxford you are going to be at that standard, you will know you have the skills to impress. The best thing to do is phone today, let us help you get your driving licence in Oxford.